The FCI, UKC, CKC and the Coton de Tuléar Club of America each maintain their own standard. The Coton de Tuléar has a medium-length, fluffy, cotton-like coat that is hair rather than fur. The FCI standard specifies that the Coton's coat should be white but may also have lemon colored, light brown, or grey markings on their ears and body, but it can't take away from the white coat. The CTCA allows for six different but equally favorable colorings: white, black-and-white, tri-color, honey bare, ferret, and black. White is described as nearly all white, sometimes with Champagne coloring on the ears and face. Black-and-white is defined as pure white with prominent black patches on the head and body (no ratio of white-to-black is specified or favored). Tri-color is described as mostly white and cream colored with some markings and dustings of black on the body and head. Honey bare is described as starting out as black spots and slowly fading to light brown or lemon color. Ferret is described as dark brown hair mixed with black hair. Black is described as all black hair. The nose is black in colour in the CTCA standard. However, the FCI standard, which does favor a black nose, states that brown is tolerable as well. A pink or partly pink nose is not accepted in either standard. The lips are tight and of the same colour as the nose, specifically black in the CTCA standard. The teeth are in a scissor bite or pincer bite. The eyes are round, dark in colour and wide set. The expression should be lively, intelligent, bright, and merry. The ears are triangular and set high. The leather of the ear should be thin. The neck is strong, without a dewlap and slightly arched. The chest is well developed and reaches below the elbows. The feet are small and arched. The back should be strong and slightly arched. The pads of the feet are usually black. The body is of moderate lengh and should have a moderate tuck up. The loin is muscular and not too long. The hind legs are strong and straight. The hind feet similar to the front feet. the Dewclaws may be removed. The tail is low set and tapering, carried over the back when in motion or excited, relaxed otherwise. The Coton is an affectionate, intelligent, playful dog breed. It loves people but as a result can have separation anxiety. It is enthusiastic and lively. But also it is a very vocal breed, grunting like a little piggy. Some Cotons have a habit of walking on their hind legs to please people. Some Cotons may exhibit shyness or cautiousness in new situations, especially around strangers, but this can be overcome with training. Most Cotons love meeting new people and are very curious in new situations. The dogs are very trainable with praise, instead of punishment, as they thrive to please people. They are great with other dogs. The Coton is generally a healthy breed. But some have had stomach issues. It has not been overbred and as a result there are no genetic diseases that are prevalent in the breed. They are currently known to be long-lived and healthy, normally living between 14 and 18 years. The Coton has a long coat which needs a thorough grooming everyday, and a bath about once a month. Cotons like Poodles are hypoallergenic so they have hair (a lot like human hair). Cotons need a walk every day for exercise, but appreciate a play session as often as possible. 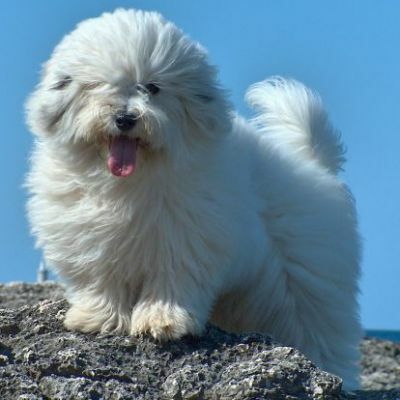 The Coton de Tuléar is the official dog of Madagascar. The Coton's ancestors were thought to have been brought to Madagascar in the 16th century by sailors from Spain and Portugal and is named after the port city of Tuléar which is currently known as Toliara. 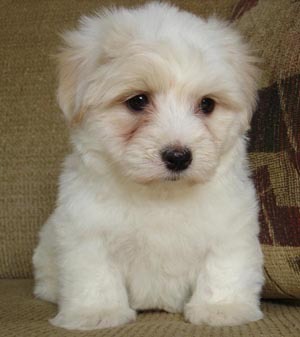 The Coton is believed to be related to the Bichon family of dogs, perhaps linked most closely to the Bichon Tenerife. The now-extinct Tenerife was introduced to the Islands of Mauritius and Reunion by sailors in the 16th and 17th centuries. The breed then acquired its cottony coat which is thought to be the result of a single gene mutation. Known then as the Coton de Reunion, they became the companions of pirates, merchants, and noblemen in travel. This small, friendly dog caught the fancy of the Merina royalty, and was bred into what is known today as the Coton de Tuléar. The Coton de Tuléar was first brought to America by Dr. Robert J. Russell in 1974. He modeled the CTCA standard after the characteristics of the Coton in its native Madagascar. The French brought the Coton de Tuléar to Europe later in 1977. They developed the FCI standard, which has a narrower description than the CTCA. In most cases, a Coton that fits the FCI standard will fit the CTCA standard as well. Today, the breed is increasing in popularity, but the dog is still largely unknown among the general population. Cotons are fancied in both Europe and America. The all-white, FCI-standard Cotons have their strongest presence in Europe. However, CTCA-standard Cotons, which most closely resemble the original Coton in its native Madagascar, are the most commonly seen in North America.